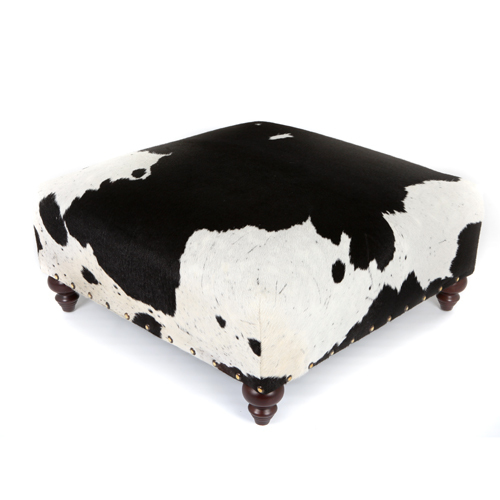 Two Huge Interior Trends this AW/18: Animal Print and Ottomans – Zulucow creates a gorgeous combination of both trends! I’m sure you’ve noticed that animal print is huge this AW/18. 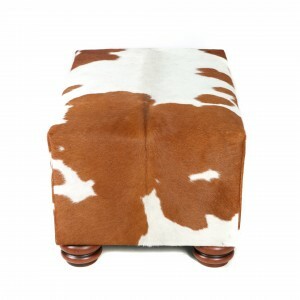 And according to ‘Living Etc’ magazine, ottomans, are also a big trend in interiors this season. 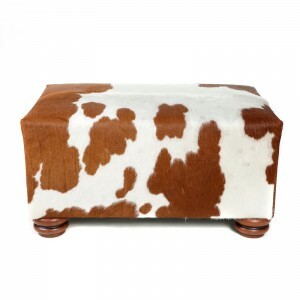 So what a happy coincidence, that Zulucow combines both trends in its bespoke cowhide ottomans! 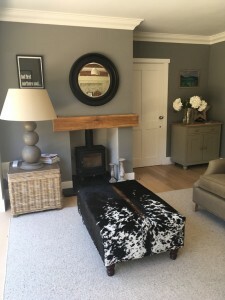 Unique, dramatic statement pieces for contemporary or more traditional homes. They are not only bang on trend; but high quality, investment pieces which will stand the test of time. 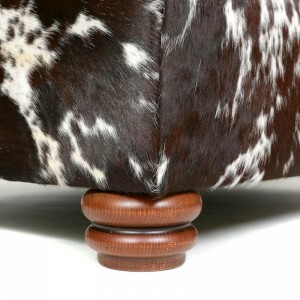 Zulucow’s furniture ‘arm’ has grown organically, in response to customer enquiries and interest. 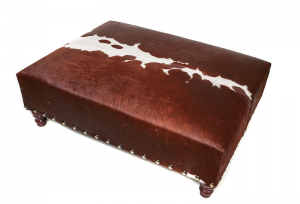 Together with my established, high-end upholsterer, we’ve created and sold many, cowhide ottomans over the last 4 years, as well as producing cowhide barstools and restoring furniture with Zulucow’s exquisite, high quality, Nguni cowhides. 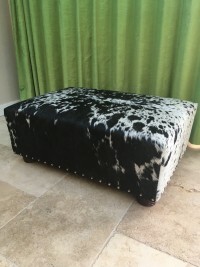 If you’d like to order a Zulucow ottoman; just select the exact cowhide you’d like from the Zulucow ‘Rugs’ page and tell me exactly how you’d like your ottoman to look. See ‘The Process’ below. 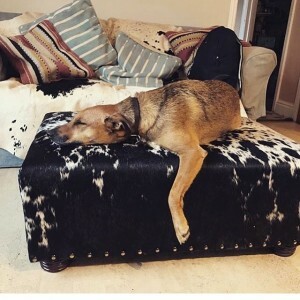 Zulucow’s cowhide ottomans make a dramatic statement in all houses, whether modern or traditional, town house or farmhouse, city apartment or country cottage. My traditional upholsterer, who’s been established in the industry for more than 30 years; finely crafts each ottoman exactly to my client’s brief. 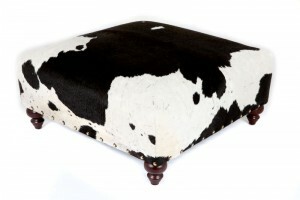 Zulucow’s ottomans have also been featured by the national media. 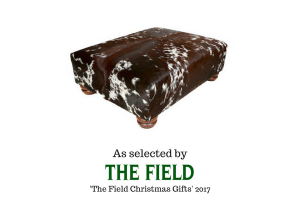 Last year, ‘The Field’ magazine selected our ottomans, as great Christmas presents; for it’s 2017 Christmas Gift List. 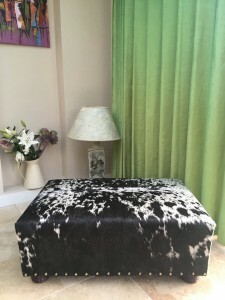 So, how do acquire your very own bespoke, finely-crafted, cowhide ottoman; an investment piece, which happens to be bang on trend and created especially for your home? 1. 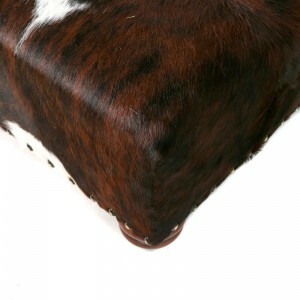 Select the cowhide you’d like to use from the Zulucow Rugs page. 2. 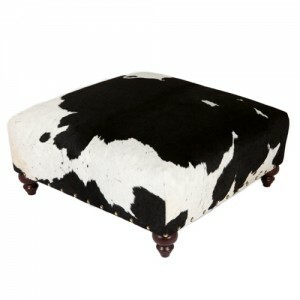 Detail all the measurements of your desired ottoman – size, height, depth. 3. 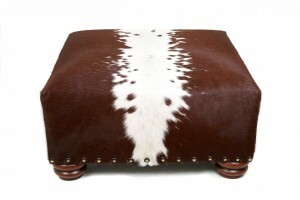 Tell me whether you’d like studs running around the bottom of your ottoman or not? 4. Do you want the taller wooden legs, or smaller bun feet (see pix) or even metal feet for your ottoman? 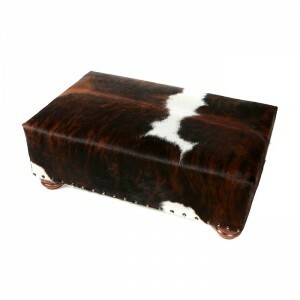 It takes approximately 4-6 weeks to produce an ottoman, but this does depend on the time of year. The lead times get longer in the run-up to Christmas. As each piece is so uniquely produced to your detailed brief, we quote to each individual project. You are of course welcome to phone Zulucow too on: 07983627710 if you want to discuss your commission in more detail. 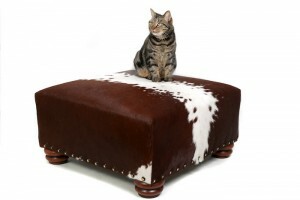 Shivas the cat and Pat ‘The Adventure Dog’ also approve of Zulucow’s ottomans! 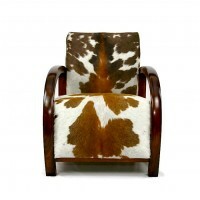 Smart, French Art Deco Armchair, upholstered with an exquisite Zulucow tricolour cowhide.